Today, I made a quick birthday card for a coworker. I cut the cupcake from the Sweet Treats Cricut cartridge. 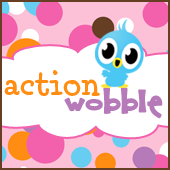 I placed the cupcake on an Action Wobble, these always add a bit of fun to any occasions card.